Films and television shows that feature hand puppets will occasionally enhance the realism of the characters by cutting to a shot of a puppet's feet walking along the ground. 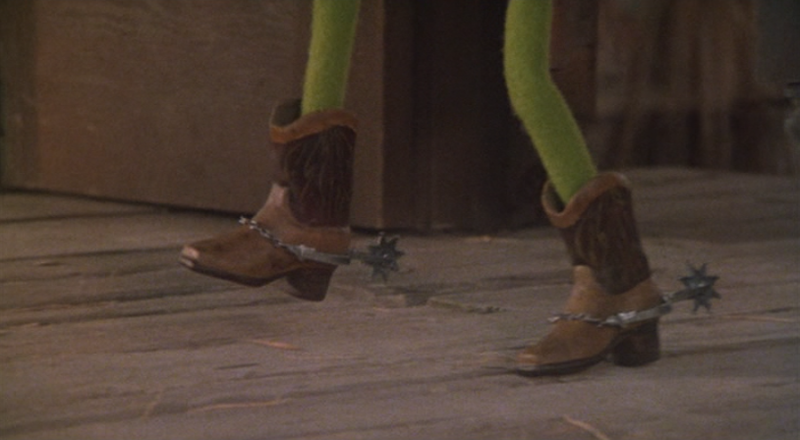 The classic example is the shot of Kermit the Frog's feet, clad in cowboy boots, as he walks out to confront the villain at the climax of The Muppet Movie. Kermit the Frog. Source: Muppet Wiki. I have never found these shots to be convincing. For one thing, the movement of the legs is unrealistic, mostly because the knees do not bend. This leaves the legs locked in one position and only able to move from the hips. A second problem is that the movement of the legs does not match the movement of the puppet as it is seen in other shots. Hand puppets have a distinctive way of walking, with a considerable amount of bobbing and swaying; shots of the legs do not reflect this, making the cut from one to the other extremely jarring. Other techniques, like switching to a shot of the puppet controlled as a marionette or manipulated bunraku-style, solve the first problem but not the second; the walk is more realistic, but the style of movement remains fundamentally different. Here I describe a new technique that eliminates both problems. 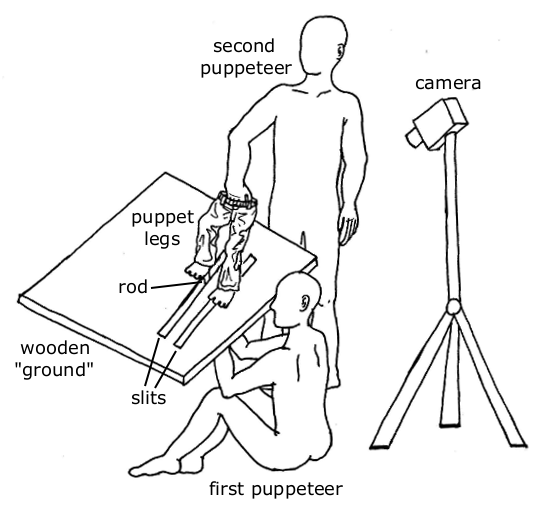 In this setup (Figure 1), one puppeteer controls the puppet's feet from below, using rods that extend through two long parallel slits in the wooden "ground". (This idea was based on the Sy Snootles puppet in the original Return of the Jedi, whose dancing feet were controlled this way in full-figure shots.) Meanwhile, a second puppeteer holds onto the puppet's hips, supporting the legs from above and imparting the necessary bobbing and swaying motion. The legs are jointed not just at the hips, but also at the knees, so that they bend when the feet are raised. The slits in the ground are hidden because the ground is covered with fuzzy carpeting (an idea inspired by Arthur Ganson's kinetic sculpture Inchworms). 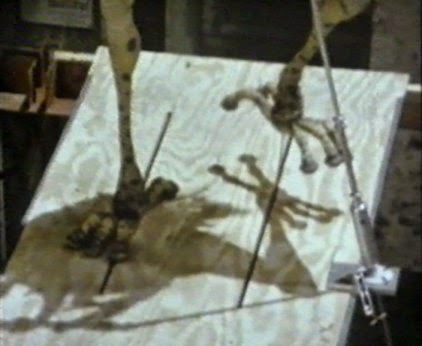 At the correct camera angle, shooting over the head of the first puppeteer, the rods that control the feet are hidden by the feet themselves. Inchworms. Source: Arthur Ganson's Machines. I designed removable foot controls, each consisting of a popsicle stick glued at a right angle to a piece of balsa wood (Figure 2). The popsicle stick served as the rod to control the foot; it was thin enough to pass easily through the slit in the ground, and broad enough to always keep the foot in its proper orientation. The balsa wood, attached to the sole of the foot with two pins that extended up into the puppet's leg and held tightly in place by a piece of rolled-up duct tape at its front edge, reinforced the foot and kept it from bending or twisting; the toes were unsupported by wood and thus able to bend. The popsicle stick was attached to the balsa wood on the far side of each foot so that it would always be hidden from the camera. It was essential that my puppet's walk be both realistic, and consistent with established movement. I consulted biomechanical references, including the photographs of Eadweard Muybridge, and took observations and measurements of the puppet's own usual style of movement. This would have to be repeated for any other puppet. Hand puppets often lean to the left and right as they walk, and this is an exaggeration of a natural human movement: our upper body tilts down toward the foot that is being placed on the ground. At the same time, our hips swing up to the opposite side, the side of the leg we are lifting. Thus, as the first puppeteer moved the feet, the second puppeteer swung the hips in a smile-shaped arc away from the foot that was on the ground. I determined the puppet's stride length -- the distance between two successive placements of the same foot -- by putting the puppet on my arm over a piece of Bristol board, "walking" it forward, and marking where its left foot fell at each step. I found that a hand puppet, with its side-to-side swaying, is actually taking very small steps, its stride length only slightly longer than the length of its foot. This stride length was adhered to by the puppeteer who manipulated the feet. I plugged the puppet's stride length and leg length into an equation that palaeontologists use to estimate an animal's speed from its footprints. This yielded a step frequency of two steps per second, which agreed with previously shot footage of the puppet. A metronome was used when shooting the legs to ensure that the pace remained constant. Taking small steps means that the feet do not have to be lifted very high. Scaling the numbers in my references down to puppet size revealed that when the heel is at its maximum height, the toe should be barely off the ground, and vice versa. In the middle of the foot's forward kick, the whole foot should barely clear the ground. My references indicated that the puppet's feet should be shoulder width apart, which in turn dictated how far apart the slits in the ground should be. 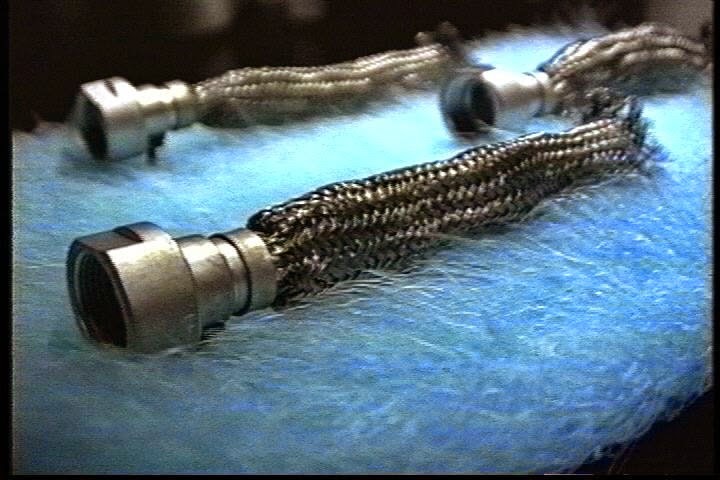 The slits themselves were five millimetres wide, small enough to be easily hidden by the carpet. The whole carpeted area was about eight square feet, but only about half of it appeared on camera. The final shot can be viewed above. I welcome anyone who wishes to build on this technique to do so. Special thanks are due to Gordon and Suzanne Harding, Julie Cruikshank, and Frederick Blichert.